So I'm starting off the Season 6 recaps with a recap that's pretty damn late, lol. Ah, well. BUT—how about that season premiere, huh? Wow. Previous season premieres kind of eased you back into the world of ASoIaF, reacquainted you with the old characters and introduced you to the new ones, but Sunday's premiere took off like a missile and didn't slow down! At the Wall, Ghost is howling because, you know, Jon Snow is lying in a pool of his own blood outside in the . . . snow. Davos hears Ghost and goes outside to investigate, joined soon after by Edd and a few other non-traitorous brothers. They take their fallen Lord Commander inside and bar themselves in the room with Ghost. There's a knock at the door, and it's Melisandre. She looks kind of dazed, saying that she saw Jon in the flames, fighting at Winterfell. Next we cut to Thorne defending his actions to the Watch, arguing that Jon's decision to bring the Wildlings to Castle Black would have destroyed them all. Back in the room where Jon, Edd, and their small group are holed up, Edd is ready to get some revenge. Davos tells him that they're way outnumbered, but perhaps the Wildlings would be willing to fight since Jon saved them and all. And so Edd goes off to see what he can do on that front. He orders Myranda's body be fed to the hounds. For a second it seemed like he actually felt some grief over her death, but nope. Then Ramsay has to hear it from his dad about Sansa and Theon escaping, and if they don't get Sansa back to rally the North when the Lannisters decide to deal with Roose's treason, they're going to be in some trouble. Ramsay's men and their dogs are in pursuit of Sansa and Theon through the snow. The pair cross an icy river to try and lose the hounds, but they get found. Theon is ready to lure the men and the dogs away and tells Sansa to go north to Castle Black, where Jon is Lord Commander. News travels slow by raven. When Ramsay's men catch up, Theon lies that Sansa is dead, but the hounds sniff her out. Just when all looks bleak, Brienne and Pod turn up! 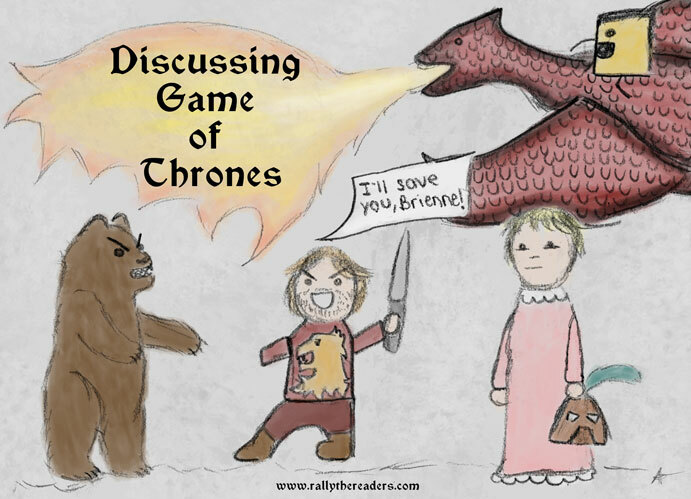 Brienne goes berserk on the Bolton soldiers, and after some fierce fighting, during which Theon saves Pod, Sansa accepts Brienne's service this time. I got a little sentimental thinking of Brienne pledging her sword to Catelyn all those seasons ago. Jaime arrives back in King's Landing from Dorne. At first Cersei, still sporting short locks, is thrilled that Myrcella has returned home, but then she catches sight of the boat and the body it's carrying. A genuinely grief-stricken Cersei tells Jaime that Maggy the Frog's prophecy is coming true, and he's like no way, and we're going to get revenge for this. And so is Loras, whom we don't see this episode. Septa (Shame!) Unella has now trained her sights on Margaery, who insists she has nothing to confess and asks to see her brother. The High Sparrow interrupts Septa Unella's interrogation session, but despite his gentler tone, he's not there to show Margaery any mercy, either. It's a Coup in Dorne! Totally didn't see this coming! In the Water Gardens of Dorne, Prince Doran receives the news that Myrcella is dead, followed by Ellaria fatally stabbing him! Tyene kills Areo Hotah, and the other two Sand Snakes, Obara and Nymeria, take care of Trystane. And just like that, two characters are gone! Tyrion and Varys stroll through the streets of Meereen, reminiscing about the time Varys smuggled Tyrion in that crate. No, no, I jest. They take in the wreckage that's become Meereen since the bloody day at the Great Games, when the Sons of the Harpy tried to assassinate Daenerys and she flew away on Drogon. Tyrion and Varys discover that the ships that Daenerys was supposed to sail to Westeros on have been destroyed as well. Jorah and Daario are looking for Daenerys, following the trail of animal carcasses that Drogon appears to have left behind. Daario isn't happy that Jorah is back, while Jorah's greyscale is looking pretty nasty—and spreading. Luckily for the pair, Jorah just so happens to find the ring that Daenerys dropped last season right before the Dothraki surrounded her. Now That We're Cool, Can I Just Get an Uber Back to Meereen? It's probably been a while since Daenerys walked this much. She has to endure the crude comments of two Dothraki who have no idea that she understands every. Word. Daenerys bides her time, finally speaking Dothraki when she's brought before Khal Moro. As a khal's widow, she's not to be touched, but asking to be taken back to Meereen is out of the question. Instead, Daenerys is to be taken to Vaes Dothrak to live out the rest of her days with the widows of other khals. And she's really not doing well. Still blind, she's begging on the streets of Braavos. The Waif shows up to pretty much beat Arya up with a stick and then call it a day. Through the closed door, Thorne offers amnesty for the men of the Night's Watch who surrender before nightfall. Davos will be allowed to leave, with food, and can even take Melisandre if he wants to. Talk about an incentive to leave! If, however, Davos and the men don't surrender by the deadline, there will be bloodshed. Melisandre is alone in her chamber, looking very weary and sad. She removes her necklace, and when she catches her reflection in the mirror, it's that of a really, really, really, really old woman. Really, really old. After a whole season away, Bran is back! Ramsay proposes storming Castle Black to intercept Sansa. Jaime faces off with the High Septon. Nice recap! I enjoyed this one too. I especially liked how they opened with Jon and Davos, I thought that was done well and it was interesting to see Melisandre shaken. I guess she now has to come to grips with how wrong she was. I think it's interesting how Margaery is free in the books but imprisoned on the show- curious how they'll handle this. And Dorne- that WAS a shocker!! Nice to see Arya again, and I'm wondering where the wildlings went. Will Edd bring them back to save Davos? Can't wait for next episode! This was the most shaken I've ever seen Melisandre. I'm curious to see when Davos finds out about what happened to Shireen and Stannis. I'm also wondering where Margaery's story arc is headed, and Loras's, too, since he's supposed to be injured at Dragonstone in the books. Snow is alive and I can't believe what happened to Doran! WTF?!?!?! Melisandre's body is rockin'! Damn, I would dip in the lady pond with her... only if she's wearing that necklace. Hahaha! My son told me she's supposed to be 400yo? Bananas! Bahaha! You're too funny, sis! I hope Mel keeps her necklace on for the rest of the season; not sure I can handle seeing that again, lol. I was pissed at what happened to Prince Doran. In the books I love the sand snakes, but I love Prince Doran as well. I feel his approach to things are more thought out and strategic. It may blow up in his face, but at least he doing things half cocked. I just knew Brienne was going to come through for the win! The Margaery/Loras storyline has me baffled right now seeing as how she has been released in the book. As far as Melisandre, somebody said that she catfished Stannis and iCackled! She was a bit overconfident and I truly wonder now what it was she was seeing about Stannis that made her so sure he was the prince who was promised. Anywho, alls I know is, they best bring me my Bae Snow back. The Dorne story line has diverged so much from the books .... I wish GRRM hadn't killed off the Red Viper; I loved him, and I miss all of the trouble he stirred up in King's Landing! I love Brienne! It meant a lot to her to fulfill at least part of her vow to Catelyn. At least Melisandre did something right- bringing back Jon, lol!